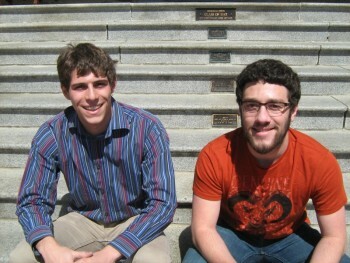 Jacob Olshansky (left) and Samuel Blau (both '12) are the two current Haverford students who earned NSF Graduate Research Fellowships. Brian Pepe-Mooney '10 is also a recipient. Two current seniors, Samuel Blau and Jacob Olshansky, and one alumnus, Brian Pepe-Mooney '10, were recently honored with National Science Foundation Graduate Research Fellowship Program (GRFP) awards. These fellowships offer three years of support from the NSF for science, technology, engineering and mathematics graduate students. The award includes a $30,000 annual stipend, a $10,500 cost-of-education allowance, and international research and professional development opportunities. Chemistry and physics double-major Olshansky will use his fellowship to fund his doctoral work in chemistry at the University of California, Berkeley, where he hopes to work in the field of physical and materials chemistry with an eye towards renewable energy applications. Blau, who is also chemistry major, is declining his NSF Graduate Research Fellowship in favor of the Department of Energy Computational Science Graduate Fellowship (DOE CSGF) that he was also recently awarded. The DOE CSGF provides a $36,000 yearly stipend, payment of all tuition and fees, academic allowances and a 12-week research practicum, all of which is renewable for up to four years. Blau will use this award to fund his doctoral work in chemical physics at Harvard University. He will, starting in mid-August, be working with Associate Professor AlÃ¡n Aspuru-Guzik doing theoretical physical chemistry research on open quantum systems, quantum dynamics and quantum computing. Pepe-Mooney, who is currently earning his Ph.D. in the Biological and Biomedical Science Program at Harvard University, will use his NSF fellowship to support his ongoing graduate work and to pursue research that matches his interest in biomaterials and regenerative medicine. Pepe-Mooney credits his Haverford professors, specifically Professor of Biology Robert Fairman and Associate Professor of Chemistry Fran Blaise (both of whom recommended him for this fellowship program), with helping him grow not only as a scientist, but also as a person.